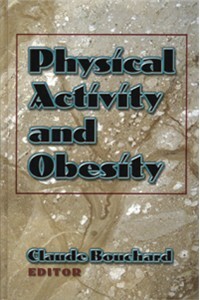 Physical Activity and Obesity is a comprehensive review of research issues pertaining to obesity. This is a multi-authored textbook, edited by Claude Bouchard, PhD, a recognized expert in obesity research. The majority of the 35 contributors are from the US, with others from Canada, UK, and The Netherlands. Chapter 18: Is It Possible to be Overweight or Obese and Fit and Healthy? It becomes quickly obvious, from the Table of Contents, that this text is comprehensive. Unfortunately, this is a major flaw, in my opinion. While the title is Physical Activity and Obesity, in fact, the text covers just about any issue relevant to obesity, including: genetic issues, research methodology, mortality rates and other public health issues, and more. It even covers, albeit briefly, topics such as alcohol, caffeine, and capsaicin. • a summary of exercise prescriptions currently recommended by various sports medicine and clinical medicine organizations and a critique of why they differ. I could not find these issues addressed adequately in this text. p. 165: "A high intensity interval program combined with endurance training..."
p. 166: "...a weight-reducing program consisting of aerobic exercise..."
p. 191: "...following 20 weeks of exercise..."
p. 230: "...3 days/week of physical education..." and "...a period of supervised physical training..."
p. 266: "...a progressive 8-week endurance program..."
p. 267: "...a progressive-resistance exercise program..."
Considering the length of this book (400 pages), I expected details such as the FITT (frequency, intensity, type, time) of these regimens and also, the recommended "dose" of exercise for obese subjects. I feel this is a major flaw which is unfortunate because, otherwise, this is a very comprehensive book. The contributors are extensive and qualified. Each chapter is very well referenced, with some chapters having over 150 citations. Physical Activity and Obesity is a comprehensive resource. However, I feel that the title is misleading. Something like Review of Current Research in Obesity Management would seem to be more appropriate.